If your ancestor had a brush with the law in Ireland there has never been a better time to find them. Findmypast now carries the complete collection of surviving Irish Petty Sessions court registers from 1828 until a hundred years ago. Covering hundreds of courts in every county in Ireland, the records will now be updated each year to bring them in line with the hundred year rule. This latest and final release includes 3 new courts - Kilmainham in Dublin, and Balla and Charlestown in County Mayo. As well as that, additional years have been added to 72 courts from 23 different counties around Ireland. 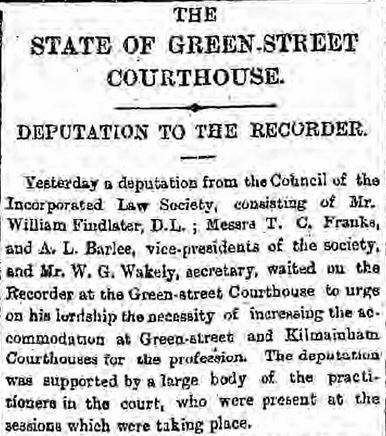 The Petty Sessions were the lowest courts in 19th century Ireland. They covered civil matters as well as criminal and are a great place to look for your 19th Century Irish ancestors. Anyone could end up before the magistrate in the Petty Sessions. On a typical day the court might hear dozens of cases and the courtroom would be hot, crowded and loud. Even the legal professions complained about the conditions in the courtrooms. The newspapers of the day often carried stories calling for improvements but most of the buildings continued in use well into the 20th century. If you sat in on one of these sessions you could find yourself next to the beer-breathed man arrested for public drunkenness the night before, leaning against the wall might be a local landholder determined to have something done about the goat that keeps wandering onto his land and eating anything that comes into its path. On the bench behind a husband and wife argue because someone forgot to pay the dog licence. On May 19th 1851, for example, in the courthouse at Kilmainham in Dublin, James McEntyre from Lucan was fined 2 shillings after his 48 hour bender. The night before he had been confined to the strong room in the police barracks where he had broken the guard’s bed and taken down part of the wall. He must have had a sore head when he appeared in court that morning. There were a few cases of assault or even the first appearances of those heading to higher courts and execution or transportation. More serious, non-capital cases, would be heard in the Quarter Sessions and the most serious cases would be heard in the Assizes, known in Ireland as the Commission Court. The Petty Sessions were aptly named, dealing with the minor disputes and misdemeanours that make up ordinary human life. The Petty Sessions were presided over by a Magistrate, a local landowner usually a member of Protestant Ascendency class but the court itself was managed by the clerk whose job it was to oversee all the paperwork that the sessions created. Among the records new to Findmypast are those that were once overseen by Georgina Frost – the first woman elected to political office in England and Ireland. Georgie Frost, as she was known, was the third generation of her family to hold the position of clerk in County Clare. When she was barred from following her father into the role at Newmarket-on-Fergus, despite being elected by the local authorities, she took her case to court. But if you really wanted to know how the Petty Sessions worked back in the 19th Century the best person to ask was no other than the creator of Dracula himself, Bram Stoker. Stoker was a court clerk himself and his first book was the rather drily named The Duties of Clerks of Petty Sessions in Ireland. Stoker was rather disparaging of his book, published in 1879, describing it as “dry as dust” You won’t need to wade through it to enjoy the register on Findmypast though.